Prior to 1847 squatters had no secure tenure over their runs as they only obtained an annual licence with no safeguard over any improvements they made should they not have their licence renewed. To address this situation the Imperial Government eventually passed an Act in 1846 to regulate the sale of crown lands in colonies which was given force by the famous order in Council dated 9 March 1847. Under this order squatters enjoyed many advantages, the main one being a pre-emptive right to purchase large blocks of land around their head stations and other major improvements that they had made, for example, woolsheds and out stations. Some shrewd and enterprising squatters saw this regulation as a chance to increase their freehold estate by also claiming pre-emptive rights for blocks along their watercourses and over water holes thus tying up most of the good land on their runs. This was not the intention of the Government’s legislation. The Crown Lands Alienation Act of 1868 continued this pre-emptive right and increased the size of the blocks allowed to be freeholded to 2560 acres whilst imposing a limit on the number of blocks that could be applied for. The evil was of long standing and had, he was sorry to say, tended to retard settlement on one of the finest portions, not only of this colony, but the whole of Australia. Any Hon. 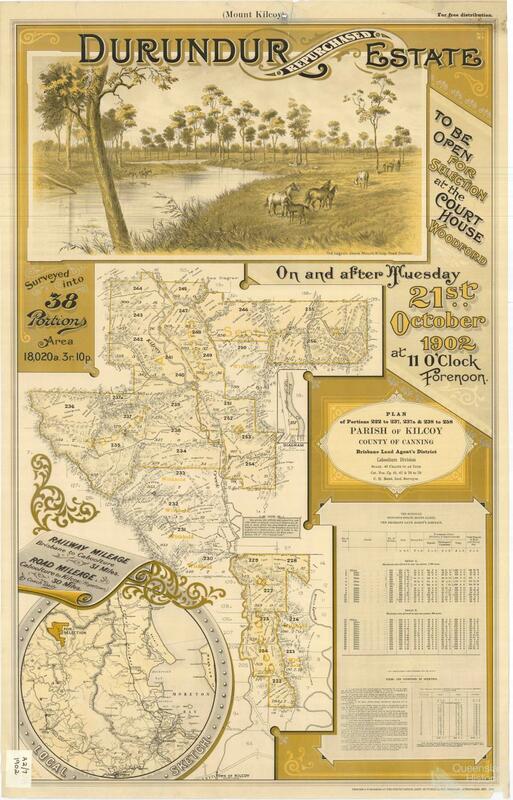 Member who had travelled over the southern and western line of railway, especially between Toowoomba and Warwick, could not but regret to see such magnificent, open, rich downs country a waste and wilderness, and by no means answering to what by nature it was eminently adapted for - namely, the habitation of human beings. What did they see? With the exception of a few isolated selections on those plains, like oases in the desert, they could see, like they saw fifteen or twenty years ago, nothing but sheep and cattle depastured on the natural grasses. 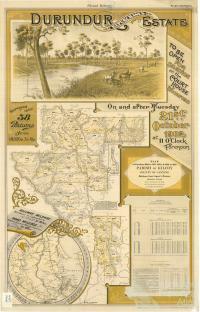 About 300,000 acres of that rich downs country, adjacent to the Southern and Western Railway and the projected Warwick and Killarney railway, was in the hands of about a dozen private gentlemen, who monopolised the cream of the country and the water frontages of the rivers and creeks. It took just over another decade before the Government acted by passing the Agricultural Land Purchase Act of 1894 which allowed for the purchase by the Crown of land suitable for immediate settlement. Offers of land submitted for surrender were to be referred to the Land Board, who were to take into consideration its fair value to the owner; the demand for land in the neighbourhood for agricultural settlement; the suitability of the land for agriculture; the permanency of the water supply; the probability of immediate settlement; and the absence of a sufficient quantity of crown lands in the neighbourhood available for agricultural settlement. The report being favourable, the land was acquired. Some year’s later amendments were made that allowed the Government to compulsorily acquire suitable land should they desire. In 1901 the original Act was amended so that the expression ‘agricultural settlement’ would include ‘settlement for dairying purposes’. This opened the way for the purchase of the Durundur Estate comprising Durundur, Holmwood and Mount Kilcoy. 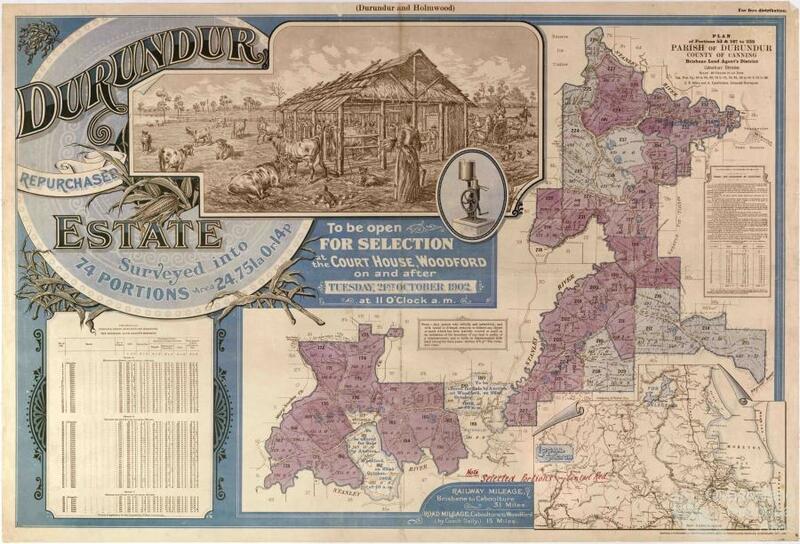 The Durundur Repurchased Estate was subdivided in 1902 by Surveyor Lymburner and the area advertised open for selection on the 21 October 1902 at the Woodford Courthouse. 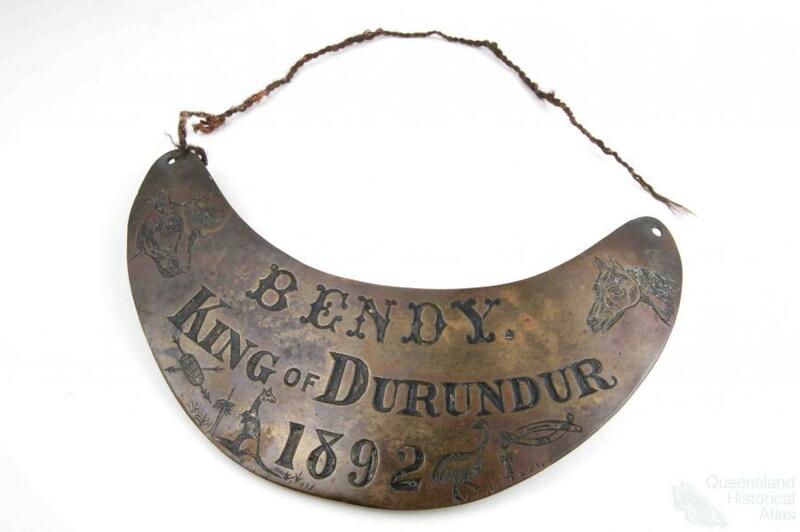 Many families were attracted to the subdivision of the Durundur Repurchased Estate in 1902. A butter factory was established in Woodford in 1906 and by the 1980s Woodford cheeses was well known in Australia. Due to changes in the industry, the Woodford factory closed in August 1995. Other areas of Queensland were included in this repurchase scheme. They included the Inkerman Estate on the Burdekin River near Home Hill and the Seaforth Estate just north of Mackay.